Apricot, Canary, Latte and Rose are the new and different palette of colors this week at The Play Date Cafe. I can't wait to see what you all create with 'em! The patterned papers are from a retired (what else? seems like all I own) Stampin' Up! kit, the name of which I cannot recall. I won them in a blog candy giveaway some time back. The sentiment and the doily behind it are from Wplus9's Mehndi Medallions. Love that set! The rose sticker is from Anna Griffin. It's obvious that last week's challenge (red with two shades of blue) was a fave among you all. There were so many players, and the work was outstanding! I had a really difficult time choosing winners. Gorgeous! Just love how you layer. So much eye candy to feast on! Totally yummy card, Colleen. Love the punched border and the colours you used. Beautiful card with all the layers! Love the border punch! Simply lovely, Colleen...I have that stamp set, too...you've inspired me to break it out again! 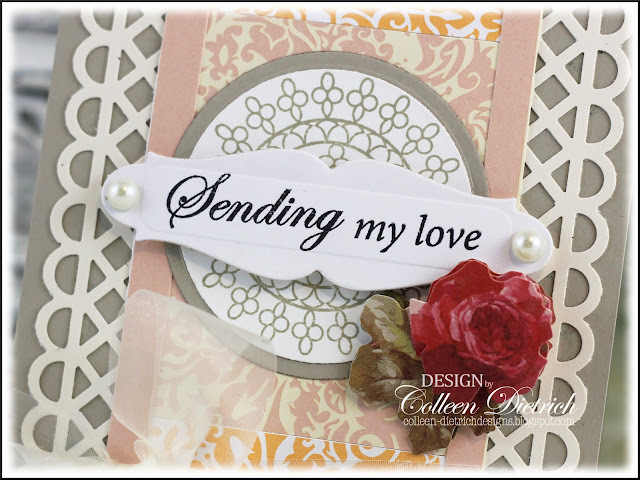 Great job with the colors and I love that sentiment tag shape...I'll have to look into getting that one! Hi Colleen! This card is so pretty! For some reason, my first thought was peach ice cream LOL. That is my favorite homemade ice cream and perfect for summer, as is your card! Apricot is an awesome color! Love your card and the garden trellis..great flower, too. Ooooo! I LOVE that set, too, girl, and you've made it shine! Delish! Such a pretty, soft look. I love the Anna Griffin flower...I love the papers and trim too. Another gorgeous card Colleen!! Love the stamps and that rose is beautiful!! Your card look wonderful. Those colors seem like they would be hard to work with. But you made them look fabulous.. OH!! I LOVE the fun look and all of the textures you used on your card!! LOVING the colors for this weeks challenge!! YEAH I can't wait to create!! THANKS for sharing and Have a FABULOUS WEEKEND!! Yikes, these colors look pretty tough--but you hit this one out of the park! All of those patterns come together to make one outstanding and lovely card! what a beauty! Such gorgeous colours this week at PDCC. I love the elegance of your card! Gorgeous! I had such a hard time with these colors...I'd love for you to link up with me at 52 Card Pickup this week! So pretty Colleen. Love the paper, the punched border... the flower embellishment looks awesome! The layers look fabulous. Um Um Um this is just gorgeous. Love the colors. Wow, gorgeous card Colleen! Love the way you used the colours and the rose is very pretty! Gorgeous card Colleen! Love the layers of everything, design and the pretty flower. TFS! Beautiful card Colleen! Love the fancy sentiment label and pretty flower embellishment! Thanks for the inspiration! Pure prettiness Colleen! I thought the rose was a real silk flower until i saw the close up...great sticker.